The Hasty Fortification is complete. The plaster cast came out of the clay in good shape. A bit of work with an x-acto cleaned up any visible mold lines and opened up the channel for the armored plates. A MDF base was added for strength and to protect the corners from handling. A roll of barbed wire was created by twisting 2 lengths of 19 gage wire around each other, then coiling the wire around a length of wood. The armored plates are floor tile, with a bit of plastic card and rivets. Over all, the Hasty Fortification was was hasty project with not more than 2 hours work spread out over three sessions. Some times its nice to have a project that can be over and done with. Lessons learned: back when I made the clay cavity, I should have textured the wrap of clay used to build up the base. It was a fast and easy way to add height to the piece, but the surface came out very smooth – a nice look for mud but not much else. The right to left slant of the wooden floor boards is very obvious now – I’ll need to pay a bit more attention next time. The Phoenix Club is site dedicated to the idea that gamers don’t have to wait for companies to product models that they are interested in purchasing. Instead, member brain storm ideas, select projects, then fund the creation of small scale model projects. The champion of the site is ‘Doctor Thunder’ who blazed the trail with his female Cadian project. Despite being a new site, the forum is rather busy and has a lot of good project ideas flying around. I intend on keeping an eye on this group to see what sort of out of the box projects they come up with. Reynolds Advanced Materials acquired PSH Industries of La Grange, IL – or so says their advertising flier. ReynoldsAM carries Smooth-On products, as well as a variety of other casting materials. Cool, a local distributor that I can drive to & pick up supplies. My last resin shipment cost me $14.00 S/H, and that’s only going to get worse as gas prices keep climbing. Even better, the on line catalog lists a full range of Gypsum products – excellent news, since my last supplier stopped selling Hydrostone. Gave the place a call and it all went down hill from there. The business is still very much a work in progress. They do have Smooth On ready to sell, but not much else – no casting plaster. Office hours are 8:30am to 5:00pm M-F, with a show case opening some time in the next few months. Not the most convenient, but I could manage to drop in if I took of from work early. Over all, a very disapointing impression after the very exciting web site/catalog & the expense of buying my name & address from smooth on. I’ll hang on for a few months and see if they get their act together. The ruin/rune base project is nearly complete. The RTV mold is finished, below are pics of the first round of resin casting. All that remains is to get a batch painted up. TerraGenesis hosts a series of monthly terrain competitions – this month, the theme is Hasty Fortifications. Perfect sort of thing to pull out the Clay Molding techniques I’ve been working on. 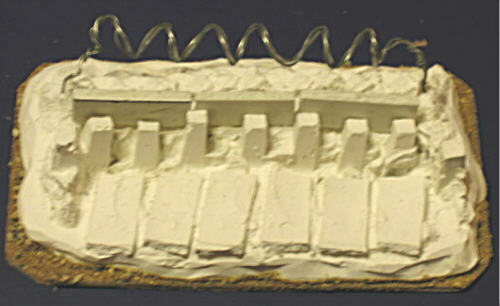 The goal is to use clay impressions to cast a small reinforced earth fortification, then add on details like armored plates, barbed wire, spent ammo, or anything else that comes up in the process. 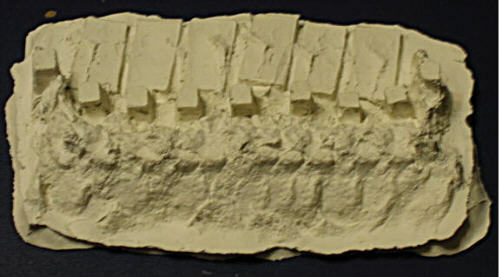 Step 1: Clay form. Other than adding more detail to the cavity, the other addition is a lip around the edge. 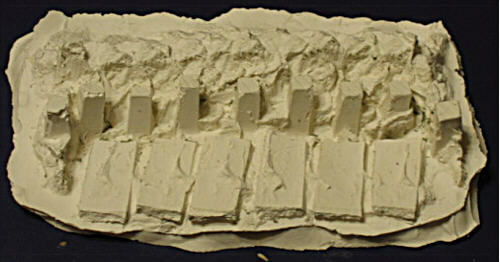 The extra clay will allow for a deeper pour, and add a sound base to the project. Step 2: Plaster cast taken from the clay. 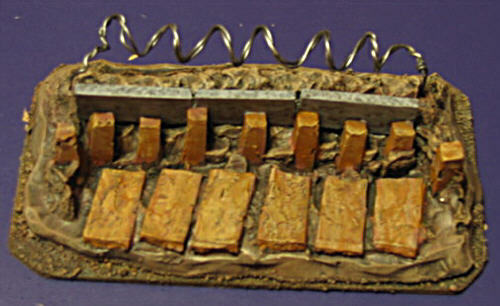 The object is about 5×3 inches and no more than 1.5 inches high. So much of terrain making is working to smash everything. Here a Japanesephotographer has appropriately “smashed” various buildings and street corners in Tokyo. Makes for very juicy images to inspire terrain building. 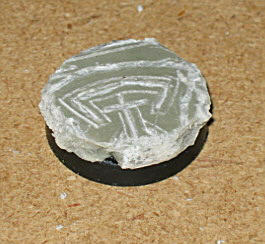 Ruin bases 25mm for 40K. Getting the Apoxie Sculpt slab off of the floor tile was a bit of a chore, but accomplished with out too much damage. 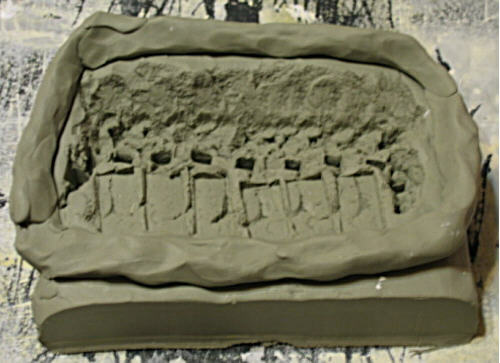 The back of the sculpt was scored & snapped into 10 pieces. Each piece is mounted on a 25mm base and trimmed using a needle nose pliers. When I first envisioned this project, I wanted all 10 bases to be linked by a common ruin pattern. Turns out, my slab was a bit over sized (the 25mm measurement is at the bottom of the base) and much of the continuity between bases was lost. Oh well, maybe some one with a sharp eye will put the puzzle together. Close up of the ruin and the base edge. Ruin bases for 40K. When playing around with Apoxie sculpt, I found the epoxie both carved well and shattered into a natural rock like look. The plan is to carve an entire floor of ruins, then cut it into 10 1×1 sections and mount on bases. Step 1: roll out a 5×2 sheet of Apoxie Sculpt to a thickness of 1/8 inch. I used a left over piece of half inch pvc as a rolling pin. Trim the sheet to the rectangular shape. The sheet is mounted on a piece of vinyl floor tile – smooth, flat and expendable if the Apoxie needs to be force-ably removed. Step 2: Etch ruins using a scribing tool and an x-acto blade. A two level technique was used for the ruins – deep cut in the center, light cut around the edges. 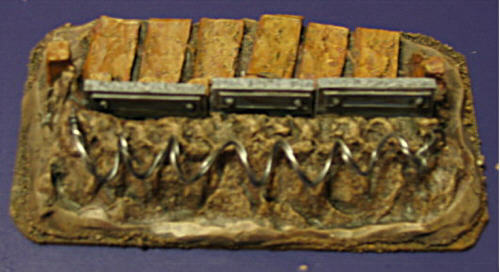 Blast Wall terrain piece for use with 40K. The piece is 6 inches long, and tall enough that only the tip of a model’s head pokes over. Main body is a triangulare wedge made from plastic card. I have this habit of just throwing things together rather than measuring out first – the wedge was going to be the body of a fortification works, but turned out to be too tall for a model to see over. Instead, I used it as is & turned the wall into an exsersise in rivets. Some time ago, I picked up a 1/16 inch hole punch from JoAnne Fabrics. Punch a bit of extra plastic card & in no time I had a pile of little round bits to use as rivets. Apply a dap of super glue with a tooth pick to the model, pick up the rivet with the tip of an xacto blade & pop it on to the model. Be sure to make a few extra rivets – they tend to fly if the pick up does not go quite right. 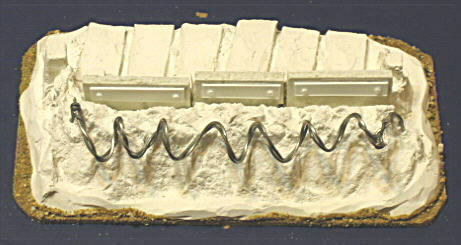 Over all, it was a piece of cake to add detail all over the model in no time at all.